Engineering, architecture, and construction companies that frequently need blueprints can quickly end up feeding profit to printers. However, printing solutions may not seem feasible, as some commercial-grade printers can cost as much as $20,000 to $200,000. Alternatively, there are cost-effective options out there. We’ll review the specialized needs of these industries and look at how the right printer can help. We’ll also look at readily available solutions businesses may not be aware of and show you how to reduce your blueprint printing costs. A wide format printer, also called a large format printer, offers users a maximum print roll width as large as 18” to 100” or more. These printers can be used to print large artwork, banners, vehicle image wraps, murals and backgrounds, posters, and more. Wide-format printers are also a critical tool for specialized industries. Engineers, architects, and construction managers need the specialized printing functionality offered by the printers. Without wide format output, these businesses will struggle to meet customer demand. Contractors and construction companies use wide format and blueprint printers for architectural drawings and construction plans. Standard print sizes simply don’t have the detail needed for construction work. There are digital solutions that provide paperless blueprints. These solutions often aren’t feasible on the job site, and most construction crews still rely on large format blueprint printing. Color printing also provides benefits for construction crews because they tend to increase comprehension and reduce errors. The architectural drawing used by contractors and construction crews start with architects and engineers. 3D printing has been adopted by many architecture firms, reducing the need for blueprints. The software required to run and use the 3D printed planning can be expensive for blueprint users. For now, architects require paper-based, large format blueprints and outputs. Planning schematics, especially for complex planning and engineering work, use wide format printing. Blueprints are very common in complex discrete manufacturing plans and electrical engineering schematics. Manufacturing shop floors and construction sites can be hard on digital equipment, making paper blueprints the output of choice for many engineers. As an engineer, architect, or contractor, you have a field of expertise that is not likely in printing and printing technology. Office technology experts like Blue Technologies have experience working with businesses like yours. They can help you choose the best solution – in-house or outsourced printing – for your business. With an outsourced printing solution provider like Blue Technologies, you work with the most advanced equipment on the market. This eliminates the bottlenecks and equipment failures that create problems for in-house printing solutions. 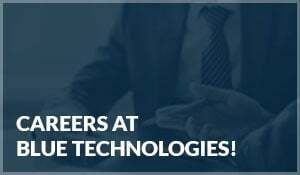 Blue Technologies also offers partnerships with other technology companies for additional value to architecture, engineering, and construction companies. This includes digital documents in addition to industry-leading print documents on vinyl media. Companies that work with Blue Technologies typically see a much lower cost per document and easy technical compliance. The additional outsourced and on-demand print resources provide increased printing flexibility. Konica Minolta AccurioPress C6100: Professional image quality and performance from a full-color printing system, delivered on an easy-to-use printer. KIP 880: Multi-function printer that includes copy, scan, and print. Delivers consistent color quality for every print. Touchscreen control makes it easy-to-use. Using Blue Technologies for managed print services will increase your print efficiency. As your print provider, Blue Technologies can optimize the solution for you, lowering your cost per print. With the right wide format, blueprint printing solution in place, you can reduce your business costs. It can provide increased operational efficiency. Specifically, architecture, construction, and engineering companies struggle with printing. It’s not a core function of the business, so they throw money and resources at it. Instead, take control of your business with a real printing solution. Contact the printing experts at Blue Technologies for more information on printing solutions like wide format and blueprint printing.